Samarkand was sacked by the Mongols under Genghis Khan in 1220 . Some of the people survived, but later Samarkand suffered at least one other Mongol sack. The town took many decades to recover from these disasters. 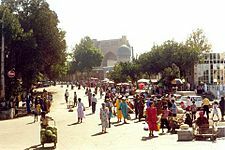 In The Travels of Marco Polo, where Polo records his journey along the Silk Road, Samarkand is described as "a very large and splendid city..." He also writes about a Christian church in Samarkand, which miraculously remained standing after a portion of its central supporting column was removed. Samarkand Facts for Kids. Kiddle Encyclopedia.